June 28, 2008 – Bridgeport, CT . . . 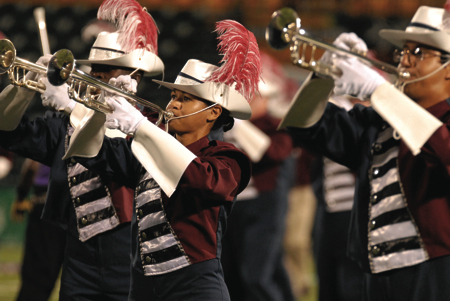 The long wait is over as Kennedy Stadium was nearly filled for six of DCA’s top 10 corps from last year as they gave fans a full night of entertainment. This marked the 60th anniversary of the “Barnum Festival” and Art Harris and his committee are to be commended for a job well done. Fellow Drum Corps World staff writer Timothy "Ace" Holleran served as emcee and performed his best despite a public address system that failed many times during the night. The Reading Buccaneers served notice that they are ready and primed for a run at a fourth consecutive DCA title, while running their winning streak to 41 competitions without a loss. "The Pursuit of Joy’ is this year’s show theme as the Bucs display various body poses by the brass line in the opening set as the brass sound builds in volume in a large arc form. The corps is well-supported by the color guard using large yellow and gold silks across the backfield. A nice baritone solo leads into the ballad, "Maria, Nessum Dorma", which was well-done and preceeded the percussion feature. The percussion line is loaded again this year as they move with ease across the field from set to set performing many visual touches. I still enjoy watching their cymbal line as they add much to the visual package with their talent. Watch for the high saber toss from the guard during the percussion feature. The closer of "Ode to Joy" begins in a large company front, then separates and reforms with the brass line spread between the 20 yard lines. Sweeping all captions this evening, Reading showed all the fans and judges that 2008 has all the ingredients in place for another championship run. The Connecticut Hurricanes had to be the happiest group in Bridgeport tonight as they finished second and for the first time in 26-years they bested the Hawthorne Caballeros. A long, hard winter of work by the corps — and with a fantastic staff in place — the Hurcs may very well be the most improved corps in DCA by season’s end. Their Western theme show is very well-designed as the corps enters from the right end zone with the color guard leading the way westward for the opening "Billy the Kid Suite". Phil Waselik introduces a strong baritone solo in the ballad, "Shenendoah", which transforms into the corps’ theme song, "Mariah". The color guard was on fire as they captured first in their caption and display a great deal of showmanship and talent throughout. The percussion section has improved greatly as well, under the guidance of Kevin Murphy, while the front ensemble has grown in size from last season. The trademark "Mag 7" is back with a twist as the contra line starts a very slow down beat, then the number starts to gain momentum. Fans will love the trumpet solo from Doug Oravez who first joined the corps in 1972 and has served as a marcher and instructor. He was the original soloist for "Mag 7". The honor guard took home top honors in their caption and are ready for a fifth straight DCA title with Rich Tardie once again at the helm. The storm warning flags are flying high over Connecticut as the Hurricanes begin their long journey to the season-ending DCA Championship in Rochester. With fan support and hard work, the corps should arrive at their final destination successfully. The Hawthorne Caballeros have another quality show in "Sketches of Spain" for 2008. It appears to me that the corps has gotten much younger, but still displayed enough talent to grow as the season moves along. "El Camino Real" opens with the guard using lime green and yellow silks and the horn line building in volume as they grab fans’ attention. The trumpet line in "Spanish Fantasy" is well-trained, but some tears in the brass charts were evident in this number. The ballad of "My Spanish Heart" has the brass line in a large arc and with the color guard woven into the form using multi-colored silks. I have read the postings on various Web sites concerning the choice of uniforms worn by the color guard. My response to that would be to focus on their work and the talent they are showing as a change of uniforms will be coming in a few weeks. The percussion section is strong again, with Gary Gil leading the way, including a large front ensemble. The nine snares were tight as the drill pattern in this feature is rapid- paced and the reverse wheel formation is once again in use. The closer of “Malaguena" has high weapon tosses from the guard as the contra line kneels and the remaining brass line moves in and out of files. A big build in volume ends a fine showing by the Caballeros. The Bushwackers have chosen "Gypsodic" as their show theme and drum major Emily Fleck is on the podium for her first season at the controls. The corps is small to start the season except color guard, as new horn players were added into the drill at various spots. The horn line at times displayed more volume than their actual numbers on the field. The color guard still displays a level of high tosses in their assignments as they seek a third straight caption title at DCA Finals. The front percussion displayed a lot of emotion and intensity tonight, while the marching line still needs to grow in numbers to build the scoring caption. The closing number begins with the horn line in various body poses while the guard uses yellow and gold silks. The show ends on a positive note as the sound is large and the visual design is well-written and achieved. I am going to have to see this show a few more times to get a good read and hopefully the numbers will increase to help this program grow. Traveling all the way from Atlanta, GA, the CorpsVets — as they were last year – received a warm reception from the fans. Drum Major Vic Kulinski, Jr. had the corps ready to entertain with their "Simple Gifts’ program and that they did. The brass line is well-stocked in numbers and equally balanced in soloists, while the percussion line is smaller than past years. The color guard is clad in solid gold uniforms with a red stripe which is really eye- catching from high up in the stands. The musical charts are based on Appalachian folk music by Aaron Copland. The effect scores tonight were good for a fourth place in music and visual. The percussion line needs a boost in numbers while the color guard connects easily with the fans, but needs to project more to the judges to bolster their scoring numbers. "Inferno" and "Simple Gifts" are excellent choices of music to tie in with the show theme as the fans in Bridgeport were not too pleased with the corps’ placing tonight. This program is enjoyable to watch and definitely will improve as the season moves along. The Rochester Crusaders have stayed with the Russian theme again this year which brought them back to the top 10 in 2007. Carol O’Brien leads the corps in the opening "Cathedral Chorus" as a baritone soloist opens with the volume building, but I was a little let down because I was ready for the big hit to come and it did not occur. I don’t think I was comparing it to Santa Clara’s, but I have always liked this number and I know that when I see them next in Endicott it will happen. Graduations in New York state this week did not help with the corps’ size as many holes were noted. Tonight the mid-range section of brass was too much at times, but still produced a quality sound. The trumpet soloist in the ballad "Stranger in Paradise" performed his assignment nicely as the rest of the horn line plays to the backfield. Incomplete guard work did not help with the visual scores, but will be easily fixed by next weekend. The closer of "Great Gate of Kiev", complete with company front, ended a nice first performance by the Crusaders who have all the tools in place to remain in DCA’s elite top 10. Opening in exhibition was the Commandant’s Own United States Marine Drum and Bugle Corps. They had the fans on their feet many times during the show. Caballero fans will appreciate the Marine’s version this year of "Malaguena" which opens with a strong baritone solo and a revolving brass block that builds with volume and a trumpet trio that nailed their musical charts. The expression "rock the house" is exactly what the Marines did as they went into a rock portion that had the fans totally involved. The grand finale of "Stars and Stripes Forever" had fans standing and clapping in unison as the Washington, D.C., corps marched in a company front to the stands. They paraded out of Kennedy Stadium with the "Marine Hymn" while fans were still standing and clapping. A truly special performance tonight and hopefully a return visit again next year from the Commandant’s Own. Members of the Buglers Hall of Fame displayed their talents with trumpet solos to the delight of the fans, while the hometown Park City Pride, under the leadership of Bob Findley, put on an outstanding exhibition. The cymbal/rifle line is just that as the nine ladies of the Pride put on a show of their own with talented cymbal playing as well as rifle work. Bob Bradley and Mike Marella make an awesome trumpet duet in "I’ll Be Seeing You" while the patriotic finale ‘America the Beautiful" — complete with a color pre and red, white and blue silks on the field — ended a great showing by the Bridgeport corps. While the scores were being tabulated, the Hawthorne Caballero Alumni Corps took the field with legendary Jim Russo leading the way. The 2008 version of this group may be their best ever as the musical charts are easily recognized by fans, while Muchacho fans will love "Pictures of Spain" with the guard wearing Muchacho guard uniforms. New this year is "Perfidia" that starts with a mellophone duet and is loaded with many soloists and ensembles. When you have a one-two punch in Frank Ponzo and Curt Hawkins, and a supporting cast of soloists as this group has, it’s not hard to see why this unit is wanted the year round to perform at shows. "Flamenco Cha Cha", with a large company front, had the fans up and standing to complete a strong performance by the Hawthorne Caballero Alumni Corps. An Olympic-style retreat followed, with the scores and special awards announced. Josh Decker of the Reading Bucaneers was voted by fans as best drum major of the evening. Every corps tonight was a winner as each one gave their all to the fans and judges and overcoming the obstacles that were put in their paths. The 2008 season promises to be an exciting and interesting one as fans can expect some heated rivalries in the upcoming weeks. Thanks to DCA officials Gil Silva, Red Corso and Glen Johnson for their valuable assistance and a big thanks to the fans who gave every corps a standing ovation as they trooped the stands. You may discuss this review on the DCP Forums HERE. We’d love to hear your feedback. 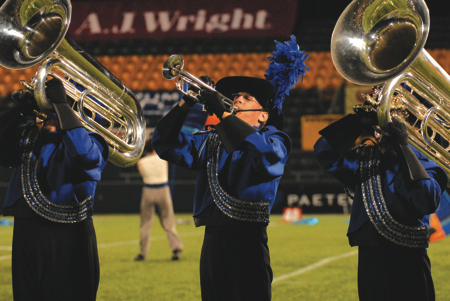 This article is presented by Drum Corps World in cooperation with Drum Corps Planet. 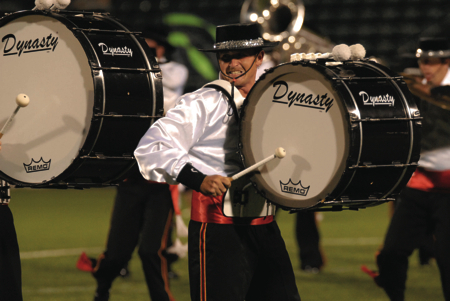 The material is exclusive to Drum Corps Planet under the "DCW On-Line" masthead as a regular feature. To see more quality reports like this one, subscribe today — www.drumcorpsworld.com or call toll free 1-800-554-9630 between 8:00 AM and 9:00 PM Central time, seven days a week. Posted by DCP Publisher on Thursday, July 3rd, 2008. Filed under DCW On-Line.